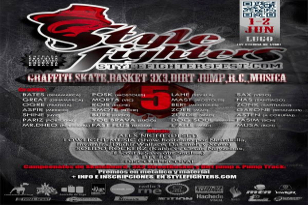 Overview: The “Style Fighters” International Graffiti Fest is an important event on the national graffiti scene and a significant bechmark on the international one, due to the large number of artists that gather here, in Lugo. Sports activities were introduced in ths 5th edition, such as skateboarding, 3-on-3 basketball or Dirt Jumping, which was organized by PROMOTIONSPORT. Performance: Planning and management of the DIRT JUMP contest.